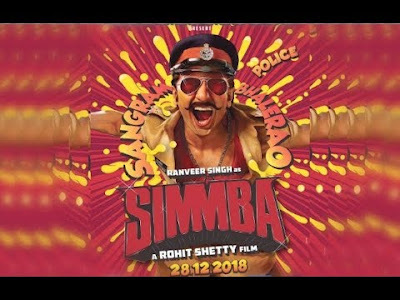 Simmba is another BlockBuster movie which is directed by Rohit Shetty which is some how related to Singham. The movie about an orphan child Simmba as Ranveer Singh as lead male role who also born and grown in Shivgadh, the birthplace of Singham. In this movie Simmba(as Ranveer Singh) wants to be Police officer. He thought that corrupt police officer most successfull then loyal officer and also take advantages of his all rights as police officer but when some tragedy made around him when his loved ones getting hurt then he realized to choose right way &amp; then he leads right way to give justice to his loved ones. Sonu Sood is characterized as Villain In movie &amp; Sara Ali Khan as lead female role in movie . Movie is such as action thriller and comedy too. This movie has some amazing songs that most hitted songs nowadays. Movie was released on 28 th December in India. Movie was also released in Gulf Counteries on 27 th December Movie some how inspired by flim Temper which was in Talugu based Langauage. Four –five scenes of temper movie are in simmba movie but in better way. Movie was mostly shooted in Goa , Hydrabad, Mehboob studio in Mumbai.